After being bombarded by Orange mobile phone adverts before every single film I've seen in 2010, which happens to feature The A-Team, now is the time to see if their rather ostentatious plan of over-advertising was worth it. Many - including myself - were surprised by the left-field casting of Liam Neeson as John 'Hannibal' Smith (was George Clooney busy? ), but it turned out to be a rather inspiring choice. That is, once you got past his painfully confused accent of Americana mixed with, good old, home grown Northern Irish. He was slick, commanding and looked just as cool as his predecessor, George Peppard with a cigar. Obviously director Joe Carnahan must have seen Neeson shooting up thugs and scumbags in the 2008 thriller Taken which shows off his action prowess and certainly even I'd think twice of calling him a mere 'old man'. Personally I thought Bradley Cooper would have made a good Murdock way before filming had even began however his take on Face was everything the character should be, charismatic, brave and certainly bold with the ladies. Very much still basking in the momentum he's built from his break-out role in last year's The Hangover. While everyone seems to think Mr T played himself back in the day (OK, he kind of did...), I thought Quinton Jackson actually did a tremendous job of fleshing out the character, B.A Baracus, from the original series. The former Ultimate Fighting Championship star-turned actor gave a brilliant account of himself, contributing a bit more depth to Baracus than simply saying 'fool' and being afraid of any form of aircraft. The scene-stealer and stand out performer of the 'Team' for myself was Sharlto Copley as the utterly insane Murdock - who provided most of the laughs from the audience, while also invoking a lot of the fun spirit of the original A-Team. It says a lot for the supporting cast if the only actor to raise a smile from me was the cameo appearance of Mad Men's Jon Hamm in the film's closing moments. Though she was perfectly competent as Cooper's token love interest, Jessica Biel really didn't contribute a big lot to the film besides being a pretty face to look at on screen, but hell it could have been worse, it could have been Megan Fox. Patrick Wilson and Gerald McRaney - who also helped pen the screenplay - performed well enough as the horribly predictable, bad guys/corrupt US government officials, which once again served their purpose. Perhaps, if a sequel is made, some more creativity would go a long way in the development of the 'bad guys' featured in these kinds of action films. However let's be honest for a minute, no one goes to see The A-Team for deep thinking or innovative character development, and if you did, you should be in the next cinema screen for Inception. The absolutely crazy, over the top, set pieces is where the film entertains massively, only in an A-Team movie could four guys survive a plane explosion by parachuting out of a tank and blowing up the two opposing planes in the process. Other pieces included an assault on Frankfurt and destroying the LA Harbour - which looked perhaps too similar to the closing scene of an overly identical film, The Losers. The plot also was perhaps a bit too convoluted than it needed to be and I was also deeply upset that the iconic van was absent for most of the film, but sure least they kept the theme song right?! The chemistry between Neeson, Cooper, Copley and Jackson was surprisingly fantastic while the action was delightfully over the top, worthy of the likes from Arnie, Sly and co. Unfortunately the brilliant performances from the stars weren't helps by a confused plot, forgettable supporting cast and some slightly dodgy CGI. Regardless, if you want a movie for mindless and enjoyable entertainment, if no other action movie will do, then perhaps you should rent The A-Team. 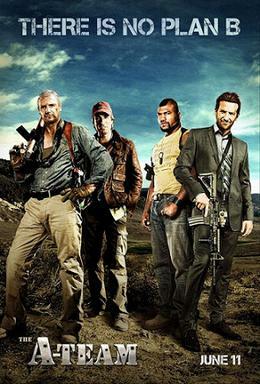 The Losers or the original A-Team TV series. The A-Team is in cinemas nationwide from today. I thought the movie was a bit slow starting off and I sat through the first hour thinking what am I doing here?! But when the pace picked up in the latter half, it wasn't half bad. 'slightly dodgy CGI' is not a phrase I wana hear in relation to a 2010 action movie. Maybe it sounds a bit harsh but I don't think there is any excuse, with the tech we have these days, for sloppy visuals. I haven't seen the film and am not in a hurry, never watched the series so don't have that fanboy nostalgia for it. What? I didn't know Goerge Clooney was going to be Hannibal...Thank God it wasn't him in the end. Clooney lacks of charisma, period. He is a good actor but has no charisma at all. Liam is a much better choice. Sharlto is amazing. I want to see him more. He is my 2nd favorite actors of this decade.